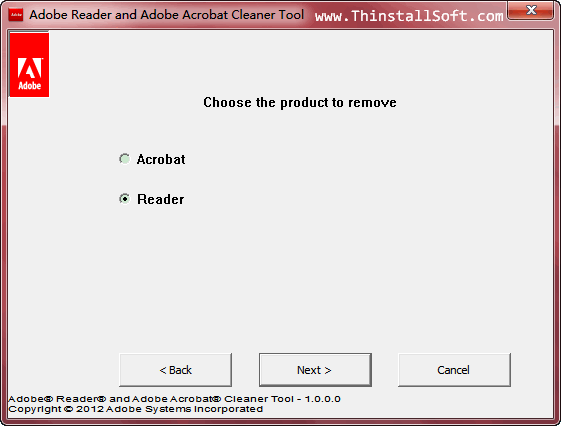 Adobe Reader and Acrobat Cleaner Tool (AcroCleaner) for Windows is a dedicated uninstaller from Adobe that could completely uninstall any standlone installation of Adobe Reader or Adboe Acrobat. Adobe Reader and Acrobat Cleaner Tool help you remove any preferences and settings that may be preserved during a standard program uninstall. Then you can reinstall them without errors. Note: Run AdbeArCleaner.exe to launch AcroCleaner Portable. The current version is Adobe Reader and Adobe Acrobat Cleaner Tool Preview 2. You could also try IObit Uninstaller Portable or GeekUninstaller Portable to forcibly delete Adobe Reader and Adobe Acrobat. To remove Office 2010 completely, you should try Remove Office 2010 Portable. This entry was posted in System Utilities and tagged acrobat cleaner uninstall, acrocleaner, adobe acrobat removal, adobe reader removal, adobe reader uninstall, adobe removal tool, uninstall, uninstaller. Bookmark the permalink.